Dance continues to be one of the most genre-bending art forms in the world today. One of the main reasons for this is the sheer scope the dance world entails—from Broadway to backup dancing, from contemporary ballet to modern dance—there are a wide variety of forms that are taught, practiced, and performed worldwide in companies, theaters, studios, and schools. As the field continues to progress in the Western world along with contemporary society, dance has stepped up to incorporate some new tricks up its sleeve. Primarily, the advent of combining circus arts with contemporary dance forms is now a common theme presented regularly worldwide. Modern circus arts have always been closely related to dance considering that many of its movement forms such as aerial arts, tightrope walking, hula hooping, juggling, and trampoline acrobatics, to name a few, are amazing feats that require great physical strength, conditioning, flexibility, coordination, and rhythm. However, the way in which circus arts and dance theater were presented was quite different until recent years. Circus arts shows are traditionally built around featuring amazing feats of human skill. Up until the 1980s, most circus shows could only be seen when they traveled through town and erected their tents to perform in. While there are still circus companies that perform like this, there are also new, contemporary circus companies who have brought circus arts to the theater. And just as circus has become infused in the dance world, more dancing has also been infused into the circus arts world. A stop at any Barnum & Bailey/Ringling Brothers show will now showcase several dance routines between the circus acts—typically, it is jazz style dancing. The biggest contemporary circus company is Cirque du Soleil, based out of Canada with regular theater and touring shows worldwide. Cirque du Soleil has created a successful blend of featured theatrical circus acts with dancing, live music and singing, acting, elaborate costuming, and more. Their shows range from the surreal to musical tributes of The Beatles, giving the audience the ability to not only dream but also relate to the overall production in a way that is inspiring and also, very human. Outside of Cirque du Soleil, circus arts can be seen featured in Broadway musicals, on cruise ships, at international resorts such as Club Med, in contemporary dance concerts, as backup dancing for singers, and in all sorts of alternative environments such as nightclubs. One of the most popular forms of circus arts dancers are picking up today is aerial dance. While traditional circus and high flying trapeze may have the artist working at heights of up to 30 feet in the air, aerial dance artists may typically work closer to the ground on apparatuses such as the trapeze, lyra (aerial hoop), or silks. 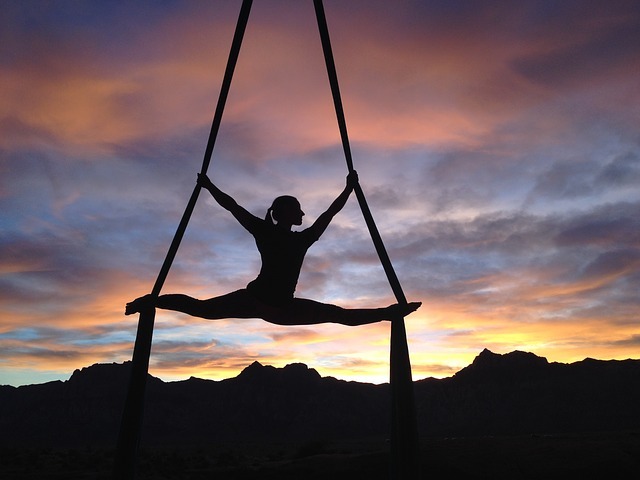 There has been an explosion of studios nationwide offering aerial dance training as not only a means of fitness, but as a way to have fun and be creative. No doubt aerial work requires strength building and a sense of living life on the edge, so it is not for the faint of heart. These studios may be good places to get your feet wet and test the waters of aerial dance; however, to truly perfect your craft, it is recommended to attend an established circus arts training school or join a company that will provide you with the appropriate training that you need. One of the exciting elements of both circus arts and contemporary dance is that they are both developing fields. The Broadway musical revival of Pippin has been a smash hit with its successful combination of circus arts, dance, and singing. Pop singer Pink has also put aerial arts in the spotlight by not only performing aerial in her own shows, but also singing while flying through the air. Most notably, her aerial/singing performances at the 2010 and 2014 Grammy Awards were aired on national television, exposing aerial dance to a more mainstream audience. Other popular music acts such as Katie Perry have followed suit in incorporating aerialists into their concert productions. Performing on cruise ships is often a secure and viable option for dancers and circus artists because they offer long-term contracts. In the past few years alone, there have been more circus-themed shows on cruises than ever before. Often the in-house production companies associated with the cruise that are in charge of the entertainment will provide aerial training to dancers who are interested and able to pass the audition and strength test. In these types of shows, the dancers will perform both ground choreography and featured group aerial acts. The shows will also feature specialty aerial and acrobalance adagio duets in between these dance sections who have trained outside of the production company on their own original act. Specialty groups that provide entertainment for corporate clients, private parties, nightclubs, festivals, and community events are also another avenue that have seen a rise in offering circus arts. Zen Arts based out of Los Angeles, California is one of the biggest companies in the United States offering this type of unique entertainment. It is also common for individuals to promote themselves as solo artists to book these types of events. The increase of online marketability through social media, personal websites, and sites such as GigSalad make it possible for soloists or fledgling companies to book themselves with more ease and accessibility than ever before. Many of these companies and artists offer acts such as aerial, stilt walking, fire dancing, cyr wheel, hula hooping, and more. Often, with training, these circus arts are readily accessible for dancers to learn and increase their versatility and ability to profit from their passion. On the flipside of the entertainment industry, there are also many exceptional modern dance/aerial arts fusion companies that perform theater and site-specific work. Companies such as Capacitor (San Francisco), Fly-By-Night Dance Theater (New York), Zaccho Dance Theatre (San Francisco), and Perpetual Motion Dance (Oklahoma City) are just a few examples of companies pushing the boundaries of artistic dance with aerial components in theater and environmental settings. The rise of the circus inside the dance world is vast and varied. In the past, circus arts may have been viewed as second-rate and unconventional, but with their foray into stage and theater work, circus arts have proven themselves to have true value in dance and culture today.